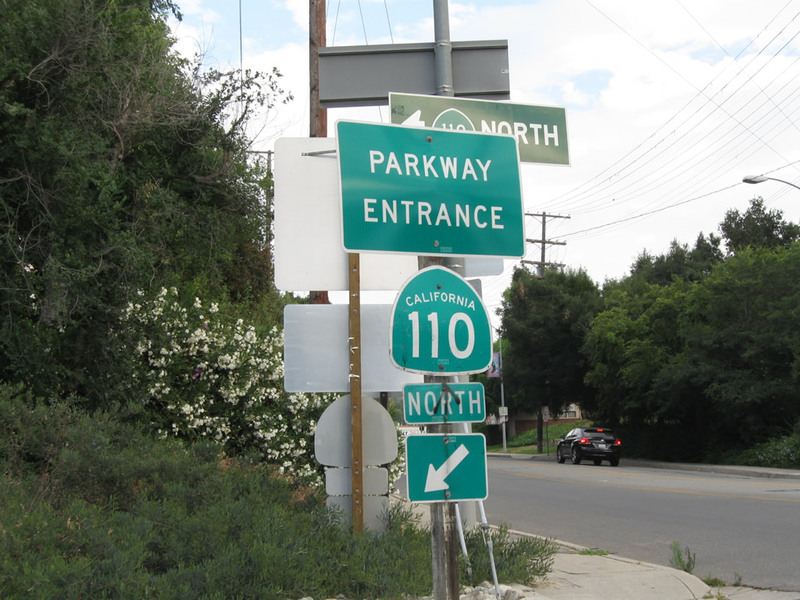 "Parkway Entrance" signs are now posted along the Arroyo Seco Parkway segment of California 110. This parkway entrance sign is posted along eastbound Avenue 60 in the Highland Park community of the city of Los Angeles. Photo taken 07/10/10. This mileage sign along northbound California 110/Pasadena Freeway provides the distance to the next three exits: Exit 24B, Hill Street; Exit 25, Academy Road; and Exit 26A, Junction Interstate 5/Golden State Freeway (Historic U.S. 99) north. This sign is mounted on Cesar Chavez Boulevard, which connects to Sunset Boulevard northwest of here. Cesar Chavez Boulevard and Sunset Boulevard are parts of the original route of U.S. 66 before it was shifted onto the Arroyo Seco Parkway freeway route. The last official designation for U.S. 66 had the route follow today&apos;s California 110 from the Four-Level Interchange northeast to Colorado Boulevard in Pasadena (including the city-maintained Arroyo Parkway segment). Photo taken 11/08/08. s California 110 curves northeast away from downtown Los Angeles, the freeway cuts between the Chinatown district to the southeast and Echo Park community to the northwest (home of Chavez Ravine and Dodger Stadium). Both communities are part of the city of Los Angeles. Use Exit 24B for Hill Street south to Chinatown and El Pueblo de los Angeles Historical Monument and Stadium Way north to Dodger Stadium. Photo taken 07/10/10. Traffic from Figueroa Street merges onto California 110 north at this point, just prior to passing under the arch bridge of College Street. The section of Arroyo Seco Parkway from here northeast to Interstate 5 was originally Figueroa Street, and the parkway was constructed on top of the existing roadway. The tunnels ahead were originally known as the Figueroa Street Tunnels, and they serve to connect the Four-Level Interchange with the original Arroyo Seco Parkway. The next exit on California 110/Pasadena Freeway (Figueroa Street/Arroyo Seco Parkway) north is Exit 24B, Hill Street. This exit is the best route to reach the home of the Los Angeles Dodgers Major League Baseball Team&apos;s Stadium. Photo taken 07/10/10. Northbound California 110/Pasadena Freeway reaches Exit 24B, Hill Street to Chinatown and Chinatown. Dodger Stadium is located to the northwest of the 110 freeway in what's popularly called "Chavez Ravine." The Los Angeles Dodgers (Major League Baseball) plays in the stadium during baseball season (August through September plus the postseason). The next exit is Exit 25, Solano Avenue, Casanova Street, and Academy Road. Photo taken 11/08/08. The offramp from California 110/Pasadena Freeway north to Exit 24B splits, with the left two lanes connecting to Stadium Way and the right lane connecting to Hill Street. Photo taken 11/08/08. A flyover ramp connects California 110 north to Stadium Way. A retaining wall separates the two roadways of California 110. The southbound lanes are higher than the northbound lanes. Ahead, the northbound lanes will pass through the Figueroa Street Tunnels, while the southbound lanes avoid the tunnels and pass above the hills. Photo taken 11/08/08. Due to the curving section of parkway ahead, Caltrans engineers added internally lit lane markers along California 110 north including the tunnels. Passing through Solano Canyon and Elysian Park, California 110 will soon approach the junction with Interstate 5/Golden State Freeway (after the Figueroa Street Tunnels). Photo taken 07/10/10. Passing under the Stadium Way flyover ramp, a "Historic Arroyo Seco Parkway" concrete monument is found alongside the California 110 parkway. Photo taken 11/08/08. Second photo taken 04/30/06. Third photo taken 01/14/07. This bridge carries traffic from California 110 south to Hill Street. After this bridge, traffic from northbound Hill Street merges onto California 110/Arroyo Seco Parkway north. Photo taken 07/10/10. Second photo taken 04/30/06. The next two exits along California 110/Arroyo Seco Parkway north are Exit 25, Solano Avenue and Academy Drive and Exit 26A, Junction Interstate 5/Golden State Freeway north. This overhead (replaced in late 2008 or early 2009) advises motorists for Interstate 5 to remain in the left lane while others continuing north on California 110/Arroyo Seco Parkway should stay in the right three lanes. Things tend to get a bit confusing with the Figueroa Street tunnels ahead, so try to select your lane here. Photo taken 07/10/10. Second photo taken 11/08/08. Making another curve, the first of the Figueroa Street tunnels comes into view along California 110/Arroyo Seco Parkway north. Stay right for Exit 25, Solano Avenue and Academy Drive and stay left for Exit 26A, Junction Interstate 5/Golden State Freeway north. An additional overhead sign for Exit 26A was added in 2008-2009 for the connection to Interstate 5 north. Photo taken 07/10/10. Second photo taken 11/08/08. The left lane of California 110/Arroyo Seco Parkway north becomes exit only for Exit 26A, Junction Interstate 5/Golden State Freeway north. An unusual changeable message sign is posted next to the exit only guide sign. Photo taken 07/10/10. This series of pictures profiles the first (southernmost) of the Figueroa Street Tunnels. Originally these tunnels were two-way; now they are one-way northbound. The first tunnel, which carries four lanes of northbound California 110/Arroyo Seco Parkway through Elysian Park, is the first of four tunnels found along California 110 north. These tunnels were built in phases to provide a connection from downtown Los Angeles to Pasadena. Photo taken 11/08/08. Second photo taken 11/08/08. Third photo taken 09/25/05. The southernmost is the longest and youngest of the tunnels, having opened in 1936. The other three tunnels opened in 1931. Connections to the Arroyo Seco Parkway were made on December 30, 1940, with the completion of the parkway. A southerly connection to the Four-Level Interchange was made on September 22, 1953, with the completion of that symmetrical stack interchange. While northbound traffic must use these tunnels, southbound traffic uses a separate alignment that avoids the tunnels (having been opened to traffic in 1943). Photos taken 07/10/10. The overhead lighting within the tunnel was changed from fluorescent lighting to a more energy effcient lighting system, with more of a pink or orange hue, by 2010. Photo taken 07/10/10. Second photo taken 09/25/05. Third photo taken 07/10/10. After the offramp to Exit 25, northbound California 110 enters the second of four tunnels along northbound. These tunnels are closely spaced, with brief glimpses of sunlight in between each tunnel. The left lane is still the exit-only lane for Exit 26A, Junction Interstate 5 north. Watch for slow or stopped traffic in the tunnels, especially as we near the left exit to Interstate 5/Golden State Freeway. Due to the open space nature of the park above the tunnels, graffiti on the tunnel entrances is quite common. Photos taken 07/10/10, 09/25/05, 11/08/08. After the left exit to Interstate 5 north at Exit 26A, the second left exit from California 110/Arroyo Seco Parkway is Exit 26B, Junction Historic Alternate U.S. 66/Figueroa Street northeast. Photo taken 07/10/10. Second photo taken 04/30/06. Now entering the third tunnel, northbound California 110 is completely separated from southbound lanes, which do not enter the tunnel system here on the original Arroyo Seco Parkway. The southbound lanes stay on-grade and therefore cut through the park. This historic route has limited shoulders and poor sight distance through this stretch. Photo taken 07/10/10. California 110 north leaves the third tunnel in Elysian Park. Only one tunnel is left before the offramp to Interstate 5 north. Again note the illuminated lane markers that delineate the main lanes from the exit only lane. Photo taken 07/10/10. A lane allocation sign for Exit 26A, Junction Interstate 5 north is posted prior to the fourth tunnel. Photo taken 07/10/10. Northbound California 110 enters the fourth and last Figueroa Street Tunnel, with all traffic for Interstate 5 northbound placed in the left lane. Note that the control city for Interstate 5 was changed from Bakersfield to Sacramento to comply with national control city standards. A sign replacement was made here by 2009. Photo taken 11/08/08. Second photo taken 09/25/05. California 110 continues through the fourth and last Figueroa Street Tunnel. With a solid white stripe separating the main lanes from the exit only lane for Exit 26A, motorists are not allowed to make the left exit unless they are in the exit-only lane. Photos taken 07/10/10. Northbound California 110/Arroyo Seco Parkway meets Exit 26A, Junction Interstate 5/Golden State Freeway (Historic U.S. 6-99) north to Bakersfield and Sacramento. Prior to 1964, U.S. 6 departed from the Arroyo Seco Parkway and turned north to follow U.S. 99 toward Newhall (Santa Clarita). This is a very sharp exit ramp, so motorists should watch their speed when departing California 110. Left exits like this are uncommon and are being phased out for safety considerations; however, much of the Arroyo Seco Parkway remains in the same configuration as it had when built in the 1940s. Due to its slow transition ramp, this offramp can be a frequent choke point due to the deceleration occurring in the left lane. In addition to the older parkway design, this sign and sign bridge are both very old structures. Photo taken 11/08/08. Second photo taken 11/25/04. Now on the transition ramp from California 110 north to Interrstate 5, the exit ramp follows this vintage alignment, with old-style guardrail on the right and intricate retaining wall on the left. Not visible to the right is the Los Angeles River, just over the precipice of the guardrail. Photo taken 08/15/03. View of the transition ramp between northbound California 110 (Exit 26A) and Interstate 5. It is almost long enough to call it a freeway in its own right. Photo taken 11/25/04. The transition ramp between California 110 north and Interstate 5 north at Exit 26A is so long that is has its own exit: Riverside Drive. After the exit to Riverside Drive, the two-lane transition ramp finally merges onto northbound Interstate 5/Golden State Freeway (Historic U.S. 6 east and U.S. 99 north). Photo taken 11/25/04. The offramp to Riverside Drive begins in the shadow of the Golden State Freeway (Interstate 5) overpass. A roadside guide sign advises of the exit. The left two lanes will swing left to merge onto northbound Interstate 5/Golden State Freeway. Photo taken 11/25/04. Immediately after leaving the fourth Figueroa Street Tunnel and after the offramp to Interstate 5 north (Exit 26A), California 110 immediately passes over the Los Angeles River. The parkway leaves Elysian Park at this point and travels between the communities of Cypress Park and Montecito Heights (both within the City of Los Angeles). Photo taken 11/08/08. Northbound California 110/Arroyo Seco Parkway reaches Exit 26B, Figueroa Street. Prior to the completion of the Arroyo Seco Parkway in 1940, Figueroa Street carried U.S. 66 and California 11 northeast to Pasadena. With the parkway's completion, both routes were transferred onto the then-nascent freeway, and Figueroa Street was designated as Alternate U.S. 66. Both the Arroyo Seco Parkway and Figueroa Street are considered to be bona fide old alignments of U.S. 66 en route to Pasadena. Behind this sign, Interstate 5 passes over California 110/Arroyo Seco Parkway. The signs here are a little worse for the wear after five years, with stains on the signs by 2010. Photo taken 09/25/05. Second photo taken 07/10/10. The actual offramp to Exit 26B is located under the shadow of the Interstate 5 overpass. Photo taken 09/25/05. California 110/Arroyo Seco Parkway passes under Avenue 26; this bridge was built in 1939 per a date stamp visible on Avenue 26 itself. Although not visible from the northbound lanes, the Arroyo Seco Parkway parallels the Arroyo Seco itself, a concrete lined stream along the east side of the parkway. The Avenue 26 bridge over Arroyo Seco opened to traffic in 1926. Avenue 26 is noteworthy for being the route of former California 163, which existed briefly between 1963 and 1965 as a state highway linking California 110 and Interstate 5 along a former alignment of U.S. 99. Photo taken 11/08/08. The next overpass provides a connection between California 110 south and Interstate 5 north/south. Photo taken 09/25/05. As traffic from Interstate 5 merges onto California 110 north, a sign welcomes motorists to the historic Arroyo Seco Parkway. Photo taken 11/08/08. The next exit along California 110/Arroyo Seco Parkway north is Exit 27, Avenue 43. Photo taken 11/08/08. This mileage sign provides the distance to the next three exits along California 110/Arroyo Seco Parkway (Pasadena Freeway) north: Exit 27, Avenue 43; Exit 28A, Avenue 52; and Exit 28B, Via Marisol. Photo taken 11/08/08. Use Exit 27 for Avenue 43 to the Lummis Home (located just west of the parkway on the banks of the Arroyo Seco), Heritage Square Museum (upon exiting, turn right/south on Homer Street), the Audubon Center at Ernest E. Debs Regional Park (turn east on Avenue 43, then north on Griffin Avenue), and the Southwest Museum of the American Indian (part of the Autry Museum; use Avenue 43 west to Figueroa Street northeast to Avenue 45 west to Marmion Way north to Museum Drive west). Photo taken 04/30/06. Northbound California 110/Arroyo Seco Parkway (Pasadena Freeway) reaches Exit 27, Avenue 43. In addition to installing a new concrete barrier on the right shoulder and decorative street lights, signage was modified at the offramp to incorporate the exit number. Photo taken 07/10/10. Second photo taken 11/08/08. Third photo taken 09/25/05. Exit 27 is the first offramp of several to feature sharp exits with limited space for deceleration. The offramp is labeled for 5 miles per hour. Immediately upon exiting to Avenue 43, the offramp crosses the parallel Arroyo Seco. Similarly, traffic entering the parkway also have limited space to accelerate to the full parkway speed. Photo taken 04/30/06. The next exit along California 110/Arroyo Seco Parkway (Pasadena Freeway) north is Exit 28A, Avenue 52. This sign is posted on the Avenue 43 overpass. Photo taken 11/08/08. Straightening out briefly, California 110 proceeds northeast with three through lanes after the Avenue 43 interchange. The Arroyo Seco continues to follow the parkway. Decorative touches to the parkway, including ornate walls and street lighting, were added to the parkway between 2008 and 2010. Photo taken 09/25/05. The next four exits from California 110/Arroyo Seco Parkway (Pasadena Freeway) north serve the Highland Park district of the city of Los Angeles: Exit 28A, Avenue 52; Exit 28B, Via Marisol; Exit 29, Avenue 60; and Exit 30A, Marmion Way and Avenue 64 to York Boulevard and Pasadena Avenue. Photo taken 07/10/10. Second photo taken 11/08/08. This mileage sign provides the distance to the next three exits from California 110/Arroyo Seco Parkway (Pasadena Freeway) north: Exit 28A, Avenue 52; Exit 28B, Via Marisol; and Exit 29, Avenue 60. Photo taken 11/08/08. An older, porcelain enamel sign is posted on California 110/Arroyo Seco Parkway (Pasadena Freeway) north for the connection to Exit 28A, Avenue 52. Photo taken 11/08/08. Northbound California 110/Arroyo Seco Parkway (Pasadena Freeway) meets Exit 28A, Avenue 52. This sign is posted immediately after the previous sign. Since the offramp is located on a curve, motorists have a limited sight distance to the gore point. Photo taken 07/10/10. The gore point sign for Avenue 52 includes the exit number. California 110 turns briefly due east to pass through this interchange. Photo taken 07/10/10. Passing under the Avenue 52 overpass, this guide sign advises that the next exit along California 110 north is Exit 28B, Via Marisol. Photo taken 04/30/06. The white wooden railing that used to separate the onramp from Avenue 52 to California 110 north has deteriorated over the years. It is likely this will be restored in some fashion along with other improvements seen along the Arroyo Seco Parkway. Photo taken 07/10/10. Northbound California 110/Arroyo Seco Parkway reaches Exit 28B, Via Marisol to Highland Park. Use this offramp to Hermon Park, which is located adjacent to the parkway and offers an opportunity to see some of the decorative parkway features while walking rather than driving. These features include a pedestrian bridge over the Arroyo Seco and the Via Marisol bridge over the parkway itself. To the park, turn right at the top of the offramp. Photo taken 07/10/10. Passing under the Via Marisol overpass, this guide sign advises that the next exit along California 110 north is Exit 29, Avenue 60. Photo taken 04/30/06. Second photo taken 07/10/10. Third photo taken 07/10/10. This mileage sign provides the distance to the next three exits along California 110/Arroyo Seco Parkway (Pasadena Freeway) north: Exit 29, Avenue 60; Exit 30A, Marmion Way and Avenue 64 to York Boulevard and Pasadena Avenue; and Exit 30B, Bridewell Street. Hermon Park lines the parkway on the east side of California 110. Photo taken 11/08/08. Northbound California 110/Arroyo Seco Parkway (Pasadena Freeway) reaches Exit 29, Avenue 60. California 110 passes under Avenue 60 at this point; the offramp will loop back to link with Avenue 60. Photo taken 09/25/05. The offramp to Exit 29, Avenue 60 is another sharp right turn with limited deceleration/acceleration lanes; note the five-mile-per-hour suggested speed for exiting traffic. Photo taken 07/10/10. This series of pictures follows the connection from California 110 north to Exit 29, Avenue 60. Upon departing the parkway, the offramp becomes two lanes (one exiting the parkway and the other entering the parkway) before crossing the Arroyo Seco and then meeting a stop sign at Avenue 60. Turn left for Avenue 60 east or right for Avenue 60 west. Photos taken 07/10/10. Back on the mainline of California 110 north, the next offramp will be Exit 30A, Marmion Way and Avenue 64 to York Boulevard and Pasadena Avenue. Photo taken 09/25/05. The next exit along California 110/Arroyo Seco Parkway north is Exit 30A, Marmion Way and Avenue 64 to York Boulevard and Pasadena Avenue. Photo taken 09/25/05. The Metro Gold Line crosses over California 110 via this steel bridge. Photo taken 11/08/08. Northbound California 110/Arroyo Seco Parkway (Pasadena Freeway) reaches Exit 30A, Marmion Way and Avenue 64 to York Boulevard and Pasadena Avenue. Photo taken 11/08/08. An auxiliary roadside guide sign for Exit 30A is posted shortly thereafter. Photo taken 07/10/10. The ramp from California 110 north to Exit 30A, Marmion Way and Avenue 64 is sharp. Photo taken 09/25/05. The next exit along California 110/Arroyo Seco Parkway north is Exit 30B, Bridewell Street. Photo taken 09/25/05. A dual-arch span crosses over California 110/Arroyo Seco Parkway. Photo taken 04/30/06. This mileage sign along California 110/Arroyo Seco Parkway north provides the distance to the final three exits: Exit 30B, Bridewell Street; Exit 31A, Orange Grove Avenue; and Exit 31B, Fair Oaks Avenue. Photo taken 11/08/08. Second photo taken 01/14/07. Stay right for the offramp from California 110/Arroyo Seco Parkway north to Bridewell Street. Photo taken 09/25/05. Northbound California 110/Arroyo Seco Parkway reaches Exit 30B, Bridewell Street. Photo taken 07/10/10. The next exit along California 110/Arroyo Seco Parkway north is Exit 31A, Orange Grove Avenue. Use this exit to the Norton Simon Museum. Photo taken 11/08/08. California 110/Arroyo Seco Parkway leaves the city of Los Angeles and enters the city of South Pasadena (population 24,292 as of 2000 Census). Photo taken 07/10/10. The next three exits from California 110/Arroyo Seco Parkway all serve the Rose Bowl in Pasadena. Photo taken 07/10/10. This mileage sign along California 110/Arroyo Seco Parkway north provides the distance to the final two exits: Exit 31A, Orange Grove Avenue and Exit 31B, Fair Oaks Avenue. Photo taken 11/08/08. Northbound California 110/Arroyo Seco Parkway meets Exit 31A, Orange Grove Avenue. The final exit will be Exit 31B, Fair Oaks Avenue. Photo taken 07/10/10. The offramp from California 110/Arroyo Seco Parkway north to Exit 31A, Orange Grove Avenue widens to two lanes. Turn left at the top of the ramp to the Rose Bowl and North Simon Museum. Photo taken 07/10/10. The next exit along California 110/Arroyo Seco Parkway north is Exit 31B, Fair Oaks Avenue. Photo taken 11/08/08. Northbound California 110/Arroyo Seco Parkway reaches Exit 31B, Fair Oaks Avenue. Photo taken 11/08/08. The offramp to Exit 31B (Fair Oaks Avenue) is again two lanes. Photo taken 04/30/06. After the Fair Oaks Avenue interchange, a yellow END FREEWAY sign is posted. Photo taken 11/08/08. As the parkway curves north, a second END FREEWAY sign is posted. Photo taken 11/08/08. Northbound California 110/Arroyo Seco Parkway approaches its northern terminus at Glenarm Street. A traffic signal governs the flow of traffic at this intersection. Photo taken 11/08/08. Two END FREEWAY signs are posted shortly thereafter. Perhaps these should say END PARKWAY? There is no END California 110 shield assembly here. Photo taken 04/30/06. California 110/Arroyo Seco Parkway changes into Arroyo Parkway at this point. The state highway ends at this traffic signal. Continue north on Arroyo Seco Parkway to the Huntington Library in San Marino and the Rose Bowl in Pasadena. Photo taken 11/08/08. Northbound California 110/Arroyo Seco Parkway meets Glenarm Street at this traffic signal. This marks the northern terminus of the Pasadena Freeway and of California 110. The state highway used to continue north all the way to Historic U.S. 66 at Colorado Boulevard, but that segment was decommissioned to the city of Pasadena. Note the changes into signage between 2005 and 2008; the reference to Interstate 210 was removed from the traffic signal mast arm. Photo taken 11/08/08. Second photo taken 09/25/05. Northbound Arroyo Parkway continues north after the Glenarm Street intersection. Caltrans used to maintain Arroyo Parkway as part of California 110 north of the end of Pasadena Freeway in the city of Pasadena, but this portion of the route was removed from the state system in the mid-2000s. Most if not all reassurance shields have since been removed, including the one located here. The city of Pasadena was incorporated on June 19, 1886, and it had a population of 133,936 as of the 2000 Census. Photo taken 11/08/08. Second photo taken 06/15/03. As part of the shift of Arroyo Parkway from state to local maintenance, a major streetscape project was underway in 2007 and 2008 to add palms in the median and improve the overall aesthetics of the road. Old concrete was paved over by fresh asphalt, which adds to a smoother driving surface but loses the historical pavement of the original roadway. Photo taken 11/08/08. Northbound Arroyo Parkway meets Fillmore Street at this traffic signal. Former California 110 had its final segment perforated by city blocks until reaching U.S. 66/Colorado Boulevard. Photo taken 11/08/08. At the northeast corner of Arroyo Parkway and Pico Street (shown here) is the Original Trader Joe&apos;s. Trader Joe&apos;s is a specialty grocery chain that opened its first store in 1967 at this location, and the store still operates today. The next traffic signal is with California Boulevard; turn left at the light to connect to Interstate 210 west. Photo taken 11/08/08. Turn left (west) on California Boulevard to the Rose Bowl; turn right (east) on California Boulevard to the Huntington Library and Gardens. Photo taken 11/08/08. Turn left at the upcoming traffic signal to Interstate 210 west (via the unsigned California 710 spur). Continue north on Arroyo Parkway for Interstate 210 east. Photo taken 11/08/08. Northbound Arroyo Parkway (former California 110) meets California Boulevard. Photo taken 11/08/08. Another California 110 north reassurance shield used to be posted on northbound Arroyo Parkway after the California Boulevard traffic signal in 2005, but it was gone by 2008. The shields were removed around the same time the concrete pavement was overlaid in asphalt and new streetscaping and street trees (including palms in the median) were added. Photo taken 09/25/05. Second photo taken 04/30/06. The next signalized intersection is with Bellevue Drive. The traffic signal was added at the time when the Arroyo Parkway improvement project was underway, as seen when comparing the 2006 and 2008 pictures. Photo taken 11/08/08. Second photo taken 04/30/06. Another set of Interstate 210 trailblazer signs is posted in advance of the Del Mar Boulevard intersection (next traffic signal). Turn left for Del Mar Boulevard west to Interstate 210 west or continue straight ahead for Interstate 210 east. Photo taken 11/08/08. Turn right at the Del Mar Boulevard intersection to Cal Tech. Photo taken 11/08/08. Northbound Arroyo Parkway (former California 110, California 11, and U.S. 66) meets Del Mar Boulevard. Photo taken 11/08/08. The next major intersection from Arroyo Parkway is with Green Street in the city of Pasadena. Turn right here for the best route to Interstate 210 east. Photo taken 11/08/08. Northbound Arroyo Parkway meets Green Street in the city of Pasadena. Photo taken 11/08/08. Northbound Arroyo Parkway (former California 110) next approaches and meets U.S. 66/Colorado Boulevard in the heart of Pasadena. This intersection marks the former northern terminus of California 110. Photo taken 11/08/08.